In 2011, Reformation Media and Press published For the Cause of the Son of God, a revised form of my doctoral dissertation. This book discussed at length the missionary significance of the Belgic Confession. My main foils were voices within the Christian Reformed Church of North America who had argued that the Belgic Confession was not only irrelevant for mission, but even a liability to a missionary church. Among the CRC scholars with whom I interacted was Harry R. Boer. What Christians in general and the civil authorities neglect to do with respect to seeking the lost lambs, this the elders of the Church shall undertake to make good in every possible way. And though they do not have an apostolic call and command to go to strange nations, yet they shall not in their several churches…permit anyone who is not associated with the congregation of Christ to be lost in error. The italics were added by Boer and I assume that the translation was his own (he does not indicate otherwise). From this Boer concludes that “even Bucer did not free himself from the Reformation conception that the Great Commission was limited to the apostles” (Pentecost and Missions, 20). When I came across this quote and conclusion in my doctoral research, I was perplexed. Certainly a later book by Bucer (De Regno Christi) sang a different tune. However, I was faced with two problems: 1) I did not have ready access to the German original of Von der waren Seelsorge (no Post-Reformation Digital Library yet) and 2) Bucer’s book had not yet been translated into English. I had no way of verifying Boer’s conclusion, but yet I wanted to acknowledge the fact that this was in the literature and offer a possible explanation. I decided to be charitable to Boer and posited that the difference between Von der waren Seelsorge and De Regno Christi might be chalked up to Bucer changing his mind over time, the former book preceding the latter by about 12 years. Alternatively, I wrote, perhaps the difference is attributable to the fact that Bucer was writing about elders in Boer’s quote, whereas in De Regno Christi, he was writing about minister-evangelists. I have recently had the opportunity to revisit this question and I think I have put it to rest. In a couple of weeks, I’m going to be speaking at two conferences in Brazil about the Reformation and evangelism. I decided to dig a little deeper into Martin Bucer. Now I have the opportunity to do that with the help of Peter Beale’s English translation of Bucer’s earlier book, Concerning the True Care of Souls. More than ever, I’m convinced that Boer got Bucer wrong. Chapter 3 deals with the management of the church. Specifically, it is about “how our Lord Jesus carries out his pastoral office and the work of our salvation through his ordained ministers.” As he does in each chapter, Bucer begins with some relevant Scripture passages. The very first one in this chapter is Matthew 28:18-20! After a number of other passages, Bucer offers some explanation. He says again that it is through his ordained ministers that Christ does his work on earth. He says, “Through them he calls all nations to reformation and declares to them forgiveness of sins…” (page 21). This, he writes, is shown by the first text mentioned. The Great Commission is applied to the ministers of the church. Bucer also has some advice for rulers in this chapter. When rulers take their spiritual responsibilities towards their subjects seriously, “then our dear God will also surely entrust them with rightly seeking out and bringing to Christ those who by birth and breeding are estranged from Christ, such as Jews, Turks, and other heathen” (page 86). Unfortunately, notes Bucer, many rulers have done a disservice to the gospel by invading and robbing foreign countries. God judges this behaviour by returning the same upon the heads of oppressors: “Thus the Jews have sucked dry the poor Christians to a remarkable extent by means of their usury, and the Turks day by day strip us of land and people with violence, making quite alarming advances” (page 87). To me it is clear that Boer was mistaken about Bucer. Not only in his later book De Regno Christi, but also in his earlier book Von der waren Seelsorge, Bucer viewed the Great Commission having continuing application in the church of Christ. Bucer never changed his mind; rather Boer misunderstood him. How and why did Boer get this wrong? I could only speculate. What I know for sure is that my own published doctoral work contains errors too (though nothing that negates my overall thesis). In some instances, I too misunderstood someone or something, in others I had incomplete information. All of us are merely human and not only prone to sin, but also to mistakes in our research and reasoning. This is why advancing scholarship in a field has to be a joint venture. As we study together and check our work, we can detect the mistakes, correct them, and move forward. 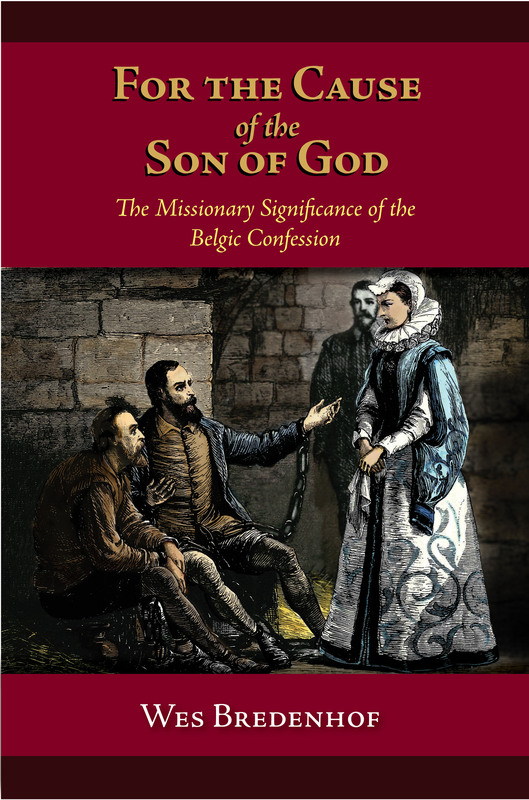 My new book on the Belgic Confession is now available for purchase from the publisher for $20.99 US. If you live somewhere other than the US, it’s available from numerous other online retailers around the world, so shop around and I’m sure you’ll find it. The Belgic Confession is regarded by its adherents as a faithful summary of the teachings of Holy Scripture. This is something which cannot be taken for granted and which is to be regarded as the foremost strength of this Confession, also when we consider its missiological relevance. From the perspective of its adherents, a confession cannot be relevant to the mission of the church if it does not take the Bible as its infallible basis. However, it falls outside the purview of this study to detail the biblical basis of each article in the Confession. Someone wanting to do that could refer to the commentaries or to Lepusculus Vallensis’ helpful reference manual, The Belgic Confession and Its Biblical Basis. In this section, we want to explore the missiological strengths of the confession on a broader level. In chapter 3 (3.1.4), we considered the Confession under the rubric of the metanarrative of martyrdom and concluded that, in this regard, the Confession is missiologically relevant. It was formulated on the foundation of martyrdom and suffering, a theology of the cross. It communicates the missionary message of martyrdom and suffering. We saw that a rich missionary harvest resulted from the martyrdom and suffering directly associated with this confession. Among our conclusions (3.3) was that any church which gives up this Confession is impoverishing itself. We will now build further on that conclusion. The precise extent of persecution and martyrdom today is notoriously difficult to measure. According to the most recent statistics of Barrett et al., 160,000 people were martyred for the Christian faith in 2000. However, a number of things need to be considered. First, these numbers are rather elastic on several levels. Barrett’s figures include 100,000 Roman Catholics, 14,000 Orthodox, 5,000 Marginal Protestants, and 1,000 Anglicans and Old Catholics. Also, as Schirrmacher notes, there are serious questions about the reliability of this data. Barrett is unwilling to discuss the data and “fails to give sufficient information on his statistic [sic] methods.” There is no validity to Barrett’s claims to offer only facts without interpretation. For instance, included in the figure are countless thousands who have died in civil wars such as those in recent times in African countries like Sudan. Finally, if these numbers are close to being correct, Schirrmacher observes that, in proportion to the world’s population, the overall number of martyrs has actually decreased since 1970. Nevertheless, both statistical and anecdotal evidence portrays a world in which many Christians continue to live under the specter of persecution. While communism has fallen in eastern Europe, it continues to be a political reality in North Korea, Cuba, Laos, Vietnam, and the most populous nation on earth, China. Even as some of these countries just mentioned adapt themselves to a free(r) market economy, active repression of Christians continues, especially in more remote regions, away from Western eyes and ears. In other countries such as Burma/Myanmar, oppressive dictatorships or military juntas persecute believers. In many nations in the Middle East, Islam is the official national religion, and Christianity is barely tolerated, if at all. In those countries where Shari’a law is in place, it is a capital offence for a Muslim to convert to Christianity. In India and other south Asian countries, militant Hinduism and Buddhism has accounted for a significant proportion of martyrdoms of Christian believers. In some regions of Mexico and elsewhere in Latin America, Roman Catholic persecution of Christians continues to be a reality, though martyrdom appears to be comparatively rare. Of course, all of that is just scratching the surface. No one who has given it any serious consideration will deny that suffering for the faith is an ongoing reality – and we expect it to continue this way until the return of the Lord Jesus. When the gospel goes out into the world, there will inevitably be opposition. When the Lord Jesus sent out the disciples in Matthew 10, he sent them out “as sheep in the midst of wolves” (10:16). He warned them that they would be delivered up to councils and scourged in synagogues. They would be brought before governors and kings. They could expect opposition from family, even to the point of death. The disciples were to expect to be hated by all for the sake of Christ’s name and being persecuted, to flee from one city to another. In John 16, the Lord Jesus spoke in a similar vein, though he added that “the time is coming that whoever kills you will think that he offers God service” (16:2). Those who do those things, according to Christ, do them because they know neither the Father nor him. The metanarrative of martyrdom embedded in the Belgic Confession awakens the church to these realities, and this is one of its greatest strengths. This happens in at least four distinct ways. First, the Belgic Confession awakens sending churches to the reality that when they send out missionaries, those missionaries may not return alive or in the same condition as they left. Missionary work can be dangerous, even life-threatening. The Confession reminds churches to count the cost. At the same time, it also encourages churches to know that if the highest price is paid by its missionaries, this too is in God’s hands and he often uses it to build his church. Second, the Belgic Confession speaks to individual missionaries and other mission personnel. Missionaries can be encouraged to know that, while their work may be dangerous and even frightening, it will never be in vain. The Confession continues to witness that even in the darkest hours, God is present and guiding the “cause of the Son of God.” He did so during the troubles in the Lowlands in the sixteenth century and he will still do so today. Next, this Confession testifies to the newer believers and younger churches on the mission fields themselves. They can read this Confession and take heart that the church has often appeared to be in dire straits, but that this was only the appearance of things. They can know that, because of their union with Christ, they are part of a greater story or metanarrative, and they are not alone in their experiences of suffering, persecution, and even martyrdom. Confessing the Belgic gives a depth of perspective to younger churches, and this encourages growth in grace and knowledge. Lepusculus Vallensis, The Belgic Confession and Its Biblical Basis (Neerlandia: Inheritance, 1993). Barrett et al., World Christian Encyclopedia (Vol. 1), 11. Schirrmacher, The Persecution of Christians, 12. Schirrmacher, The Persecution of Christians, 11. For some of the anecdotal evidence, see Paul Marshall, Their Blood Cries Out: The Worldwide Tragedy of Modern Christians Who Are Dying for Their Faith (Dallas: Word Publishing, 1997). For the Cause of the Son of God can be purchased online here. The Belgic Confession has been a gospel witness sealed in blood ever since its first edition was thrown over a wall to Roman Catholic authorities inside the castle of Tournai. Dr. Bredenhof sets the Confession at the intersection of biblical, theological, and historical discussions over the church’s mission. He draws from international scholarship and a broad array of academic disciplines in providing a holistic challenge to the caricature of the Reformation as an inward-focused neglect of the church’s missionary enterprise. Especially interesting is the connection Dr. Bredenhof draws between the Confession and the suffering martyr-witness of the confessing church to a lost world. For the Cause of the Son of God will be welcome by those who love the Reformed confessional witness to biblical truth and who are zealous for the world-wide preaching of the gospel. Good news! The book is just about ready to go to print. We’re at the last stages of the process. Hopefully it will be available in the next month or so.